Erik Vonderheide stands in front of the Cessna 172, a small plane he flies out of the Ashland Regional Airport. A small plane, a Cessna 172, circles in the skies above Worthington. It makes its way to the Ashland Regional Airport where it touches down on the runway, only to regain speed and take off again. At the helm is 16-year-old Erik Vonderheide. At just 16 he can fly an airplane all on his own. In fact, he recently flew the aircraft solo before he got his driver’s permit. He talked recently to The Daily Independent about flying a plane solo for the first time. Erik Vonderheide completes his preflight assessment of the plane he will fly during his flight lesson. Marc stood between Erik's current instructor Brady Lipscomb and his first instructor Dan Bricker as Erik circled the airport high above them. “The first time he took off I was standing out there with both instructors and his original one, Dan said 'that take off was perfect' and his current instructor Brady said 'yeah and right about now he's realizing, oh shucks, I've gotta land this thing,'” Marc remembered. That proved to be true. “When I got up there it was just kind of peaceful at first then it hit me, oh, I'm in a plane, I should focus. I've got to land!” Erik said. When Erik was a baby he took his first plane ride to Germany, where his mother is from, and as a little kid was fascinated by the machines, his father said. 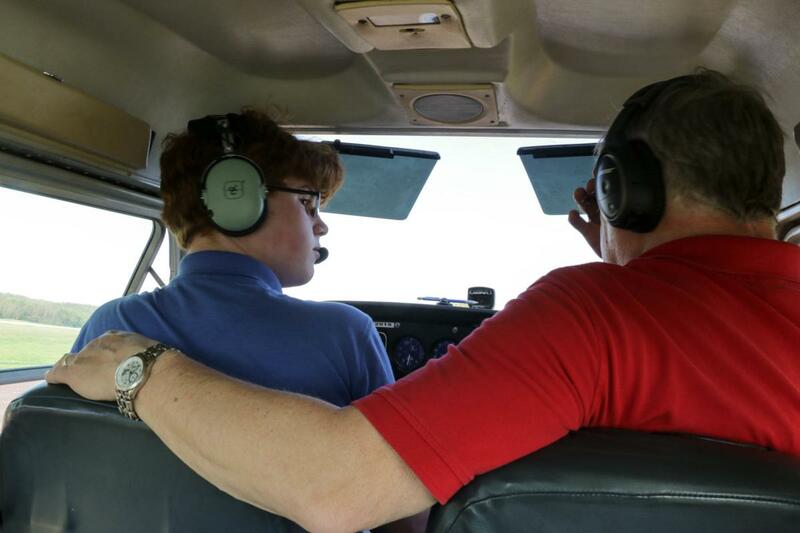 When he was 10-years-old Erik received two flying lessons for Christmas from his parents. 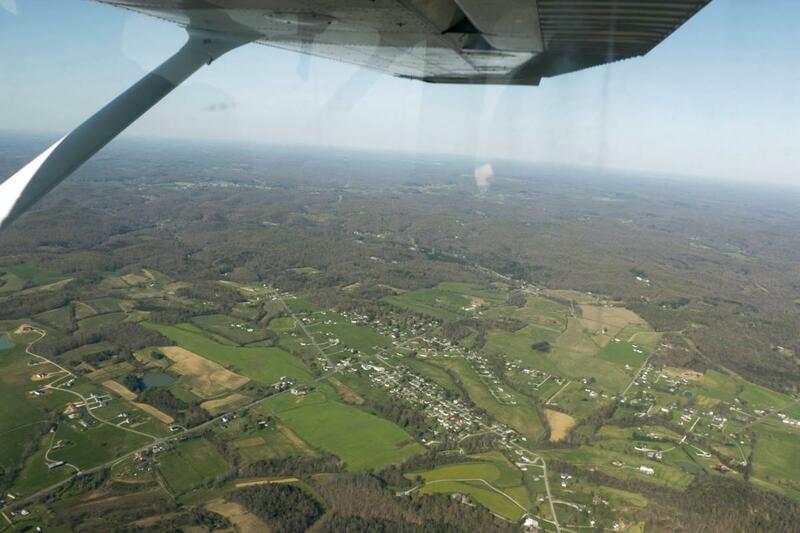 Sixteen-year-old student pilot Erik Vonderheide and flight instructor Brady Lipscomb fly to Portsmouth, Ohio. “He had always talked about planes when he was growing up and that Christmas we bought our daughter two horse back riding lessons and looked for things to buy him for Christmas and decided, after my wife and I talked, we'd try flying lessons, even if he just go to go up, fly around and come back down,” Marc said. That first lesson took place just a few days after Christmas. “We did the first lesson and from then on, I was like I'm set,” Erik said. At 10 he was too short to reach the pedals and had to sit on a pillow to see over the dash. Erik Vonderheide looks to flight instructor Brady Lipscomb after his final landing of the lesson. 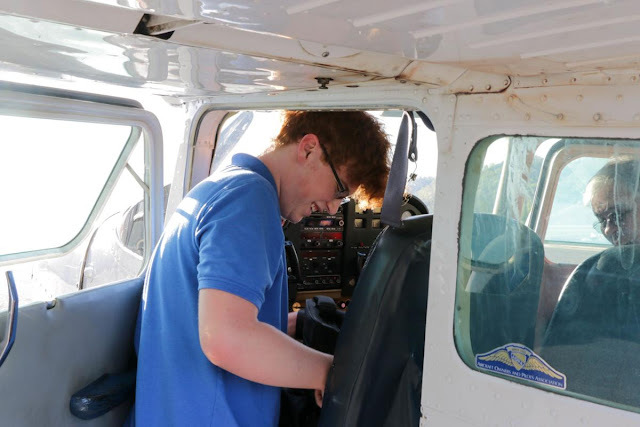 Now, at 16, Erik has his intermediate pilot's license and can fly within 25 miles of the Ashland Regional Airport with other restrictions on things such as visibility, speed and height. He and his current instructor Brady Lipscomb are working to ‘solo him’ at surrounding airports such as Portsmouth, Lawrence County and TriState Airports. He will then be able to fly with the same restrictions at those airports and if the 25 mile radius touches, he can fly from one airport to another. Erik successfully flew a plane by himself before he went and got his permit to drive a car. 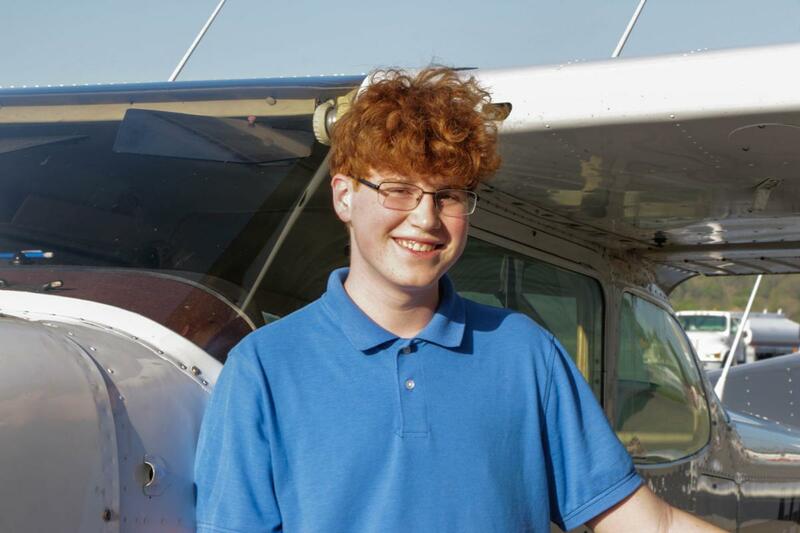 Now his goal is to get his full pilot's license when he turns 17 next April, which will eliminate the restrictions. 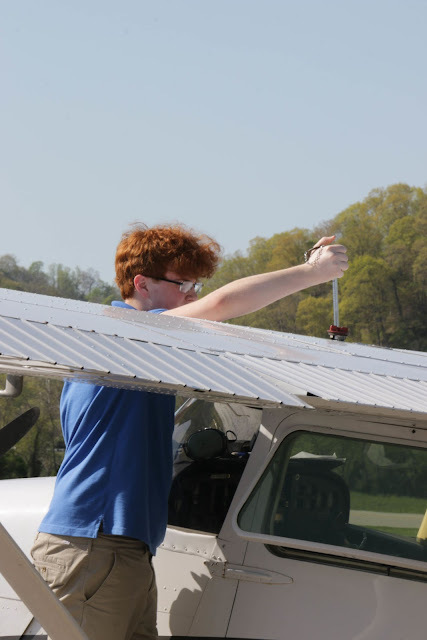 “What he has done, not very many 16-year-olds do,” Lipscomb said, adding that Erik is only the third one in Lipscomb's 25 years of flight instruction to do so. Erik Vonderheide packs up and cleans up the plane after his flight lesson. Many, especially when Erik was younger, didn't believe he was flying planes in his free time. “Nobody believed me,” he said, even his teachers thought he was making it up. “I remember I brought pictures to school and I was showing people. Everybody was like, 'No, you're just saying that, you're not doing anything,'” he said. Erik recalled when his best friend told him he didn't believe him, so he brought him to the airport and took him on a flight. When they landed his friend looked at him and said “maybe I was wrong,” Erik laughed. Now, he's being asked by people if they can come out and fly with him. The Daily Independent was able to tag along on a flight. 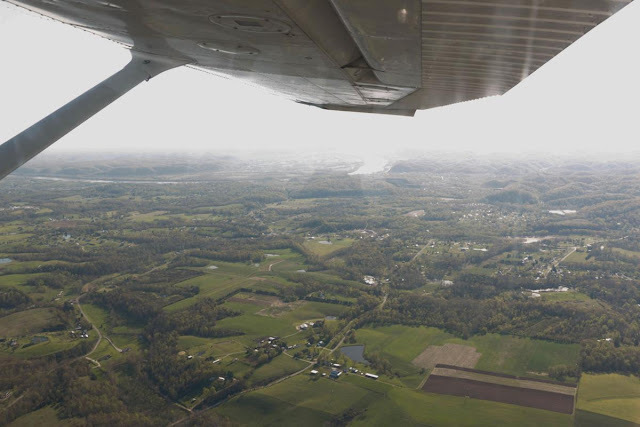 Over the course of about an hour, Erik took off from the Ashland Regional Airport and flew to Portsmouth where he practiced touch-and-go landings before returning to Ashland. The view from the plane as Erik Vonderheide flies from Ashland Regional Airport to Portsmouth, Ohio. Cross winds began to affect the flight and Lipscomb watched and advised as Erik made decisions. Lipscomb is always testing Erik, whether it be a situation he puts him in or just asking questions during the flight. 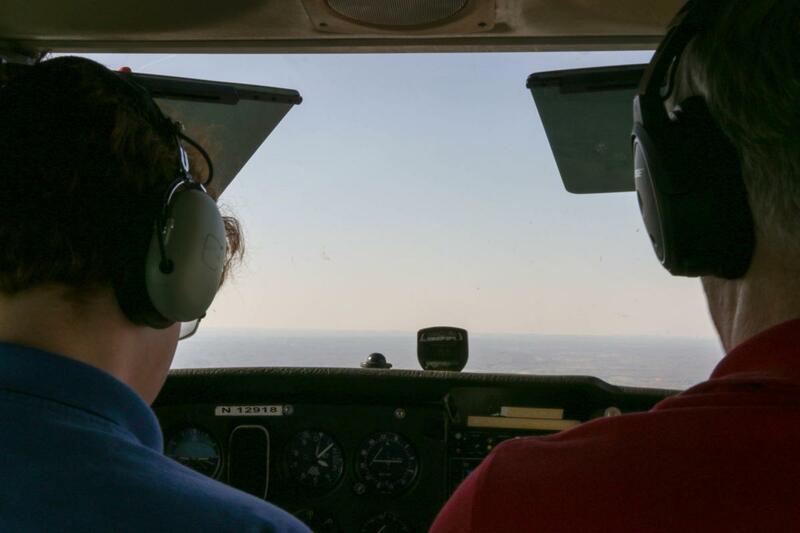 Lipscomb explained that Erik isn't just learning to maneuver a plane, but to make good decisions as a pilot. The less Lipscomb talks during a flight, the better a student is doing, he said. “Their goal is to shut me up, it doesn't happen,” he joked. There were many moments of silence where Erik didn't need instruction, at other points he did, sometimes Lipscomb was testing him or the two were just talking. 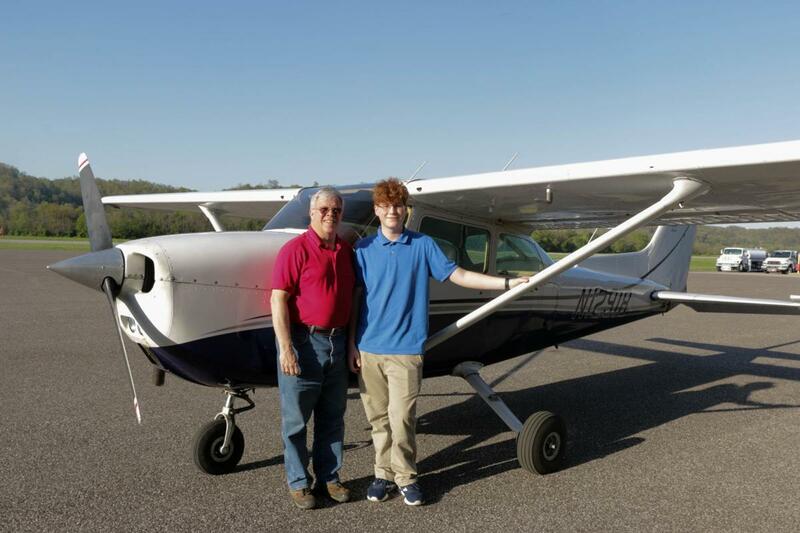 Flight instructor Brady Lipscomb and 16-year-old student pilot Erik Vonderheide stand in front of the Cessna 172. On one particular landing, Erik felt he wasn't entering the runway quite right, so he pulled the plane back up, circled the airport and went in again, able to land the plane and taxi in. Lipscomb applauded him for making a wise decision, something he likes to see from students. Erik knows his limitations and made a smart decision in that moment, he said. Erik continues to learn. He flies as much as possible and has a flight simulator at home he works with when he can't actually be in the air. His future career goal is to fly commercial planes. He's considered living in Dubai and flying for Emirates Airlines. Now he's leaning towards living in Los Angeles, California, with the hopes of flying for American Airlines. He hasn't figured out his future exactly, but he knows he wants to be a pilot.